Through the entrance, security checkpoint, spacious halls and to the left of the common area resides remnants of a typical science classroom: microscopes, graphics, a white board and insect containers. Inside, while typically listening to country music or sounds of nature, a group of women are in the throes of a year-long process to facilitate the metamorphosis of over 1,000 tiny eggs into beautiful Taylor's checkerspot butterflies. These women are, however, not students. Instead, they're inmates of Coffee Creek Correctional Facility. 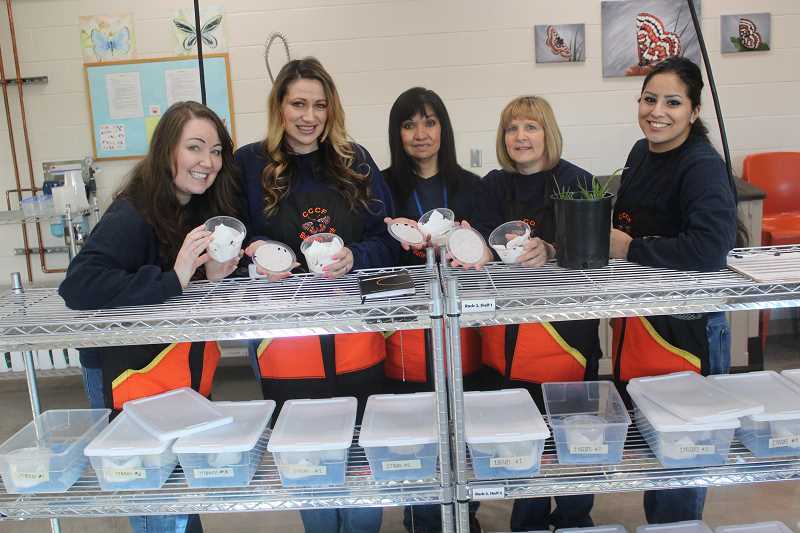 And through the facility's sustainability program, they have not only helped save the endangered butterfly from extinction but many have also gained a passion, sense of purpose and knowledge base that could serve them well when they leave prison. "I can tell friends and family that while in the midst of being in a correctional facility, I'm doing something that's very impactful," inmate Sarah Martin said. 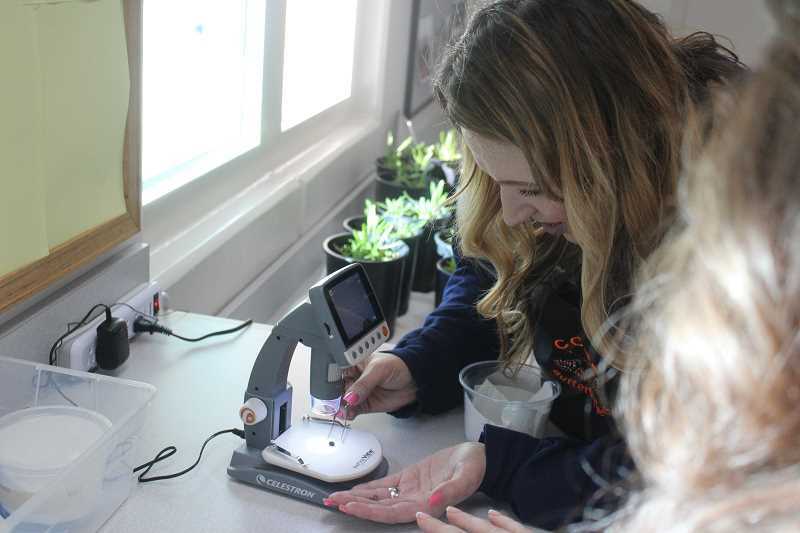 The program is a collaboration between Coffee Creek, the Oregon Zoo and the United States Fish and Wildlife Service to protect the Taylor's checkerspot butterfly, which was listed as endangered by the United States Endangered Species Act in 2013. A separate group of inmates in Coffee Creek cultivates viola plants, which provide the threatened SilverSpot butterflies with sustenance. Coffee Creek Sustainability Programs Manager Chad Naugle said the Taylor's checkerspot butterfly needs monitoring in a controlled environment to survive. And Coffee Creek provides this service. "By taking them to a controlled environment and rearing them, there's pretty close to a 98 percent success rate, which was the reverse out in the wild," he said. In the lab inmates have observed countless phenomena such as eggs being laid in a cluster, a single scout meandering from the cluster to the top of a container to investigate sunlight and the caterpillars' bodies turning green when they're vomiting and red when they have diarrhea. Inmate Crystal Sullenger enjoys seeing the caterpillars stretch during hibernation. "I see the caterpillar stretch and curl up. I see their feet move," she said. "I can imagine them yawning. It's like they're hitting the snooze button." The inmates spend a portion of every day in the lab and tick off butterfly facts effortlessly. "I talked with Oregon Zoo staff about working in a zoo," inmate Carolyn Exum said. "A zookeeper said we have more knowledge than someone with a Ph.D."
Because mother identification is important to restoration efforts, the inmates place each egg cluster into separate cups and label the cups. As they grow, the eggs and caterpillars are separated into smaller groups and bigger cups. The inmates also feed them plantago plants cultivated in the outdoor horticulture program. However, the caterpillars are sent back to their natural habitat before they hatch. The process lasts over a year, yet the butterflies' lifespan is less than two weeks. To Naugle, the experience is intrinsically meaningful. "It's proven that when you connect people with nature there's stress reductions. It's therapeutic. There's health benefits. And a lot of the nature activities being outside, it's more of a meaningful work opportunity for adults in custody," Naugle said. "And we're finding out it is a behavioral modification tool because the adults in custody who truly want to be out here remain in good conduct, (demonstrating) good behavior to get into these positions." And members of these programs also attain a certificate from the Institute of Applied Ecology. "They can show their future bosses 'I did this!'" Naugle said. Martin said her daughter's eyes glimmered when she told her about restoration efforts. "She's like, 'Mom, you're a veterinarian,'" Martin said. "And I kind of am." After sowing the seeds, the outdoor program inmates actually get to travel to protective habitats to plant the viola seeds. Last year, they took them to Nestucca Bay National Wildlife Refuge. "They get to see the full circle of the program," Naugle said. Naugle says more nonprofits should consider collaborating with prisons for sustainability efforts. "I don't think the state agencies and nonprofits realize how impactful the Department of Corrections can be with restoration efforts and even emergency efforts," he said. Correctional facilities are an asset, Naugle says, because they generally have an abundance of space outdoors and inmates who seek meaningful activities. "I think we have an underserved population that needs work but we're also an underutilized agency," he said. Sullenger hopes to use the knowledge and tools she learned through the program and apply it once she leaves prison. "So many companies are felony-friendly now so we have the opportunity to take what we've learned beyond these walls," she said. And along with practical knowledge, inmate Marisol Sedano has gained wisdom through the program. "When you go to prison you don't think you're going to do good for the world," she said. "This teaches you values and about life."